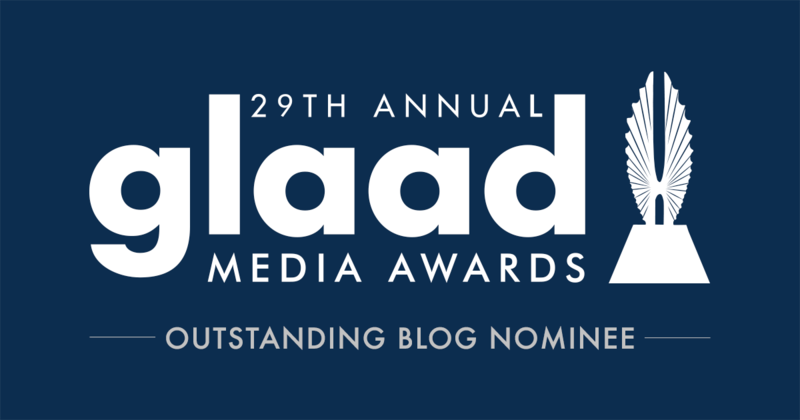 Top Gay Dad Photo Essays of 2018! 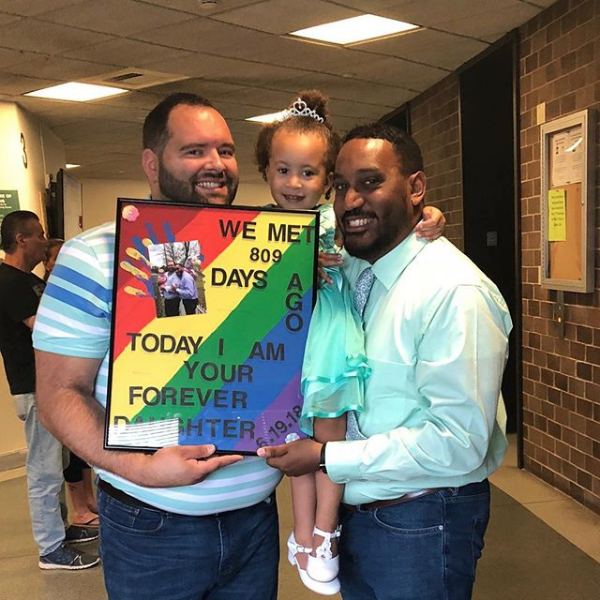 If there's one thing we've learned about our followers, it's this: you like pics of loving gay dads with their kids as much as we enjoy sharing them! Here were some of your favorites of this past year. 11 Reasons We're Loving Insta-Hunks "Dads Not Daddies"
"Worth Every Hardship": Congrats to Gay Men Whose Families Grew This Month! Adoptions, births and more: congrats to the guys in our community whose families expanded this month! 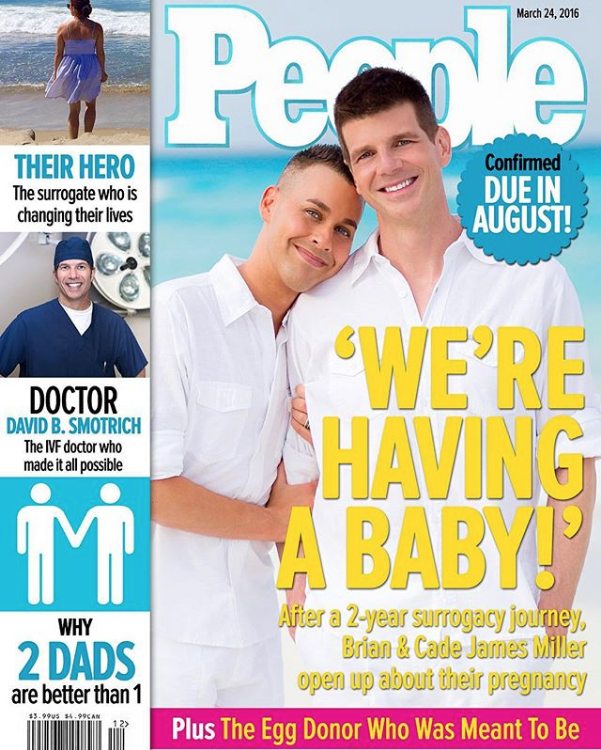 Gay men go through a lot of ups and downs on the path to parenthood. It can be one of the most emotionally draining times in our lives. But as each of these 10 families who are celebrating births and adoptions this month: it's worth every hardship. Congrats dads! 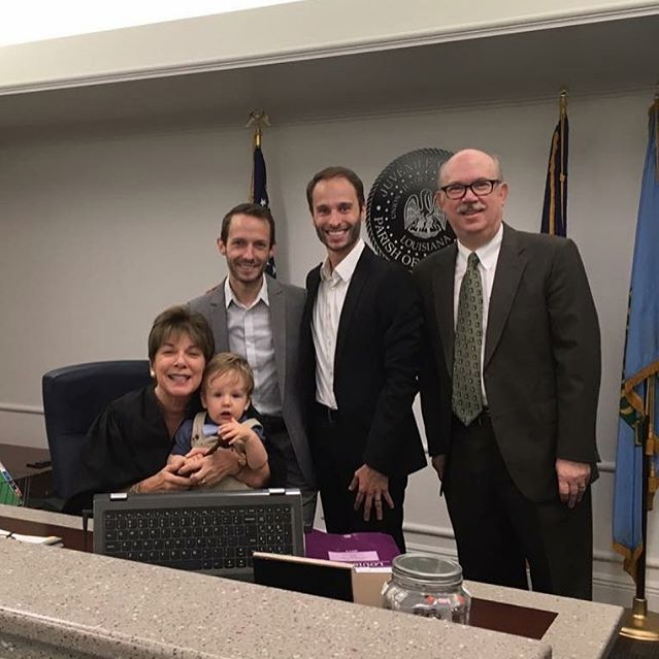 Congratulations Matthew and David on finalizing the adoption of their youngest son, Finn! 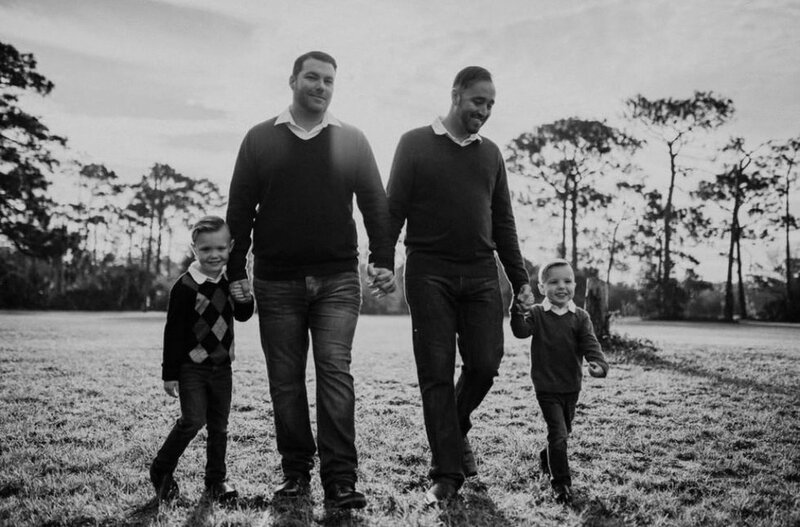 Matthew and David always knew they wanted to adopt and have created their family through three open adoptions. They finalized their youngest son Finn's adoption May 10 at Marlborough Court House, Massachusetts. "We feel as though our family is complete with the finalization of our son Finn!" said Matthew. Their eldest Miles was adopted in 2012, then 3 years later they adopted their second child, Ava. Now they are a forever family of five with sweet Finn. Congratulations to dads Nick and Sean on finalizing the adoption of their daughter Piper! Sean and Nick have been Piper's dads since birth and before she was born as they attended appointments with her birth mom. On May 23 in Columbus, Ohio, her adoption was finalized. "After our first born daughter passed away at age 3 months due to prematurity health issues, we know that Piper's sister loved her daddies so much that she wanted a little sister and for us to be happy again." 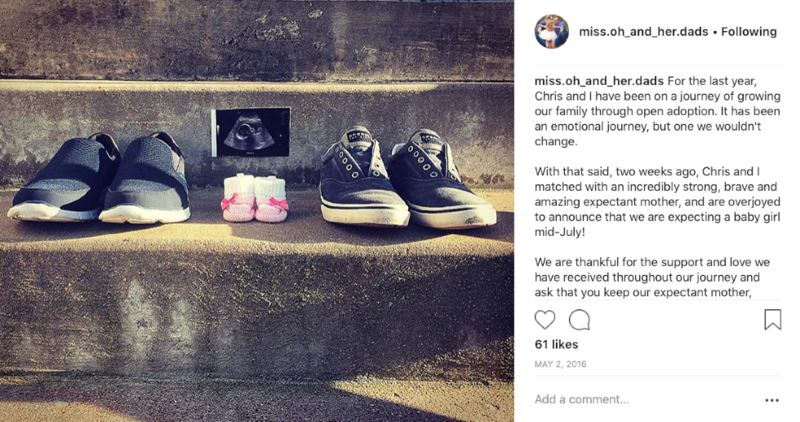 We're thrilled for this forever two-dad family! Congratulations to new dads Markus and Alan on the birth of their twins Luca and Nico! Luca and Nico were born to proud fathers Markus (Daddy) and Alan (Dad) in San Francisco on May 19, 2018. "Think about all the happy moments in life... now... combine those moments and multiply by a thousand and that was how we felt when our boys were born and realized that we were dads," shared Markus. "It's been a six year process for us, in terms of trying to have children," said Alan, "and we finally did it!" Congratulations to dads Ryan and Rich on the adoption of their baby girl, Charlie! 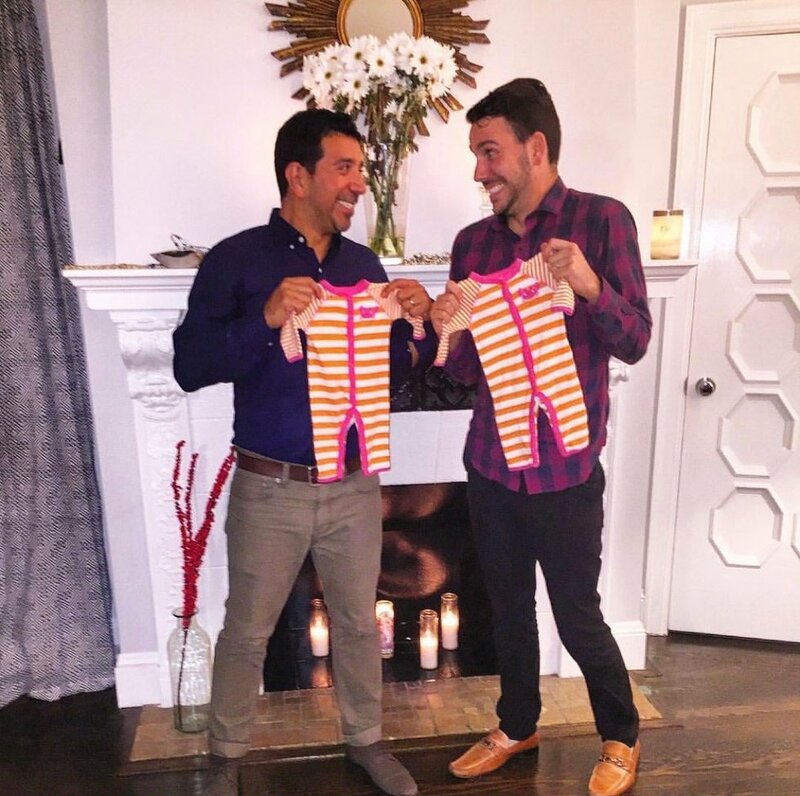 Ryan and Rich found out three days before Charlie was born that they were going to be dads. They flew to Nevada and met their daughter when she was 2 hours old. "You can do all the planning in the world, read every book, article and blog on what parenting is all about," said Ryan, "but nothing prepares you for the first time you hold them and you realize that you are their entire world." "Everything before that, every hardship, unsuccessful match, months of waiting, were all worth it!" added Rich. "We'd do it again because it brought us our beautiful baby girl and made us a family." Congratulations to Dennis and John on finalizing the adoption of Brendon and Blake! Brendon and Blake were first placed with John and Dennis in November 2016. They had already been in foster care since May 2015 and with another family prior to John and Dennis. (They're still close with Brendon and Blake's first foster family.) On November 17, 2017, the boys adoption was finalized, and the dads were over the moon. "The day of the adoption our hearts were all over the place and our emotions were flying!" shared Dennis. "Sitting int he court room waiting for them to call our names, we cried like babies." "We knew that those moments would make our family whole and would ensure that our boys would be safe with us forever," added John. "It's just a feeling that's indescribable; it was flood of emotions that felt like our lives had been leading up to that moment." Congratulations to dads Gabriel and Diego on the birth of their son Gauthier! On June 2, Gauthier was welcomed into the world by his two doting dads! This Argentinian family is thrilled to finally be fathers. "I felt like I was missing the air in my chest because it was so full with love!" shared Gabriel as he recalled the first time he laid eyes upon his son. We wish this new family of three all the happiness in the world! Congratulations to dads Jason and Brian on the birth of their daughter Sydney! Jason and Brian became first-time dads through adoption when their daughter Sydney was born on June 4 in Salt Lake City, where they live. "When we saw Sydney for the first time it felt like time stopped," shared Jason. "As kids growing up in a conservative state, we never thought having a family was possible. And as much progress as the world makes, those tiny doubts never really leave you, making life with Sydney equally surreal and incredible." Congratulations Steve and Ben on finalizing the adoption of your son Hudson! Husbands Steve and Ben finalized the adoption of their son Hudson on September 17, 2017. Because they were an out of state adoption they finalized in Louisiana after already having Hudson live with them for a year. "We were nervous for finalization day, but overwhelmed with joy to know that all of the logistics had finally caught up to what we already knew in our hearts from the moment Hudson was born," said Steve. This forever family of three live in Orlando, Florida. Congratulations to dads James and Andrew on the adoption of their daughter Olivia! Olivia had been with her dads and her forever family for 806 days before her adoption as finalized. Needless to say, the dads are overjoyed to have finally made it official. "Truly there are no words to describe how we felt," said James after the day Olivia's adoption was finalized. "She was our daughter the moment we held her in our arms, but that day we forever became her fathers legally." "We are beyond lucky to be her dads and we are so grateful," added Andrew. Olivia joins little brother Brandon in her forever family of four. Congratulations to new dads Kunal and Jason on the birth of Alessandra! Kunal and Jason became dads with the help of a close friend who was their surrogate. Their super girl was born June 24, 2018 and the dad cannot wait to spoil her! "The moment she was born," shared Kunal, "her little finger grasped both our fingers, and at that very moment we felt our whole life had been waiting for this amazing moment." The new dads are thrilled to share their love with their baby girl. 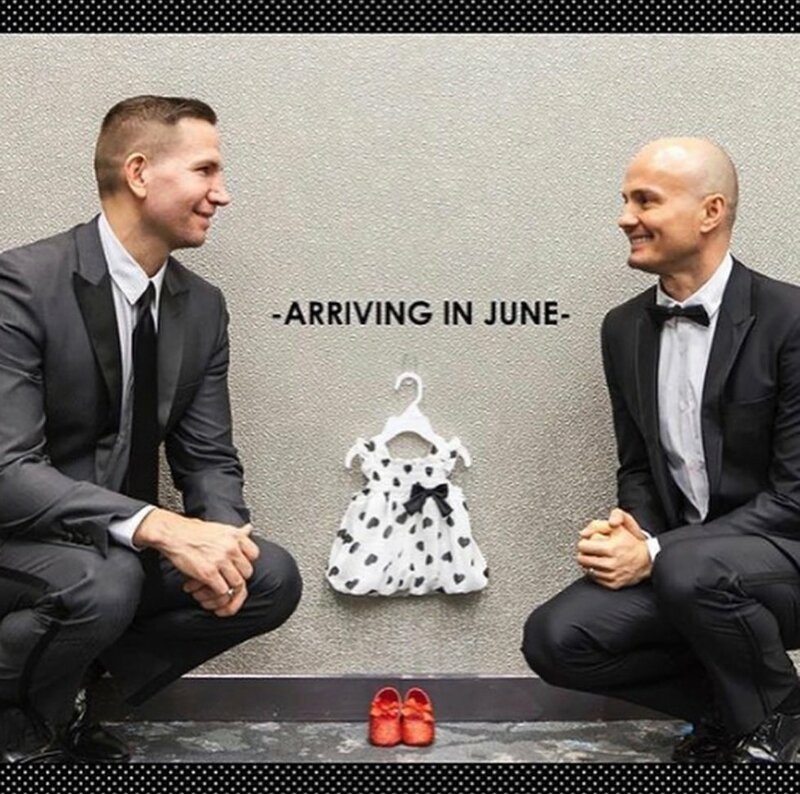 These gay dads went over and beyond in announcing the arrival of their babies. If there's an Instagram moment at stake, it's pretty safe to assume gay dads are gonna crush the competition. (See: gay dads being extra, in the best way, on Halloween, Easter, and even National Superhero Day ;) So it should come as a surprise to absolutely no one that gay dads-to-be absolutely slay their pregnancy announcement pics. Check out our latest roundup below, and share yours with us too! For even more announcement pics, check out our first round up here! When you know there's no such thing as "too pink..."